Which one is the odd one out? A chocolate bar, a cucumber or a banana? Try and spot which foods in the picture are unhealthy, and put a circle round each one. Then you'll know which foods are the odd ones out! 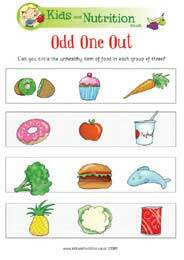 Why not Download the Odd One Out Food Puzzle and see if you can spot the unhealthy food.